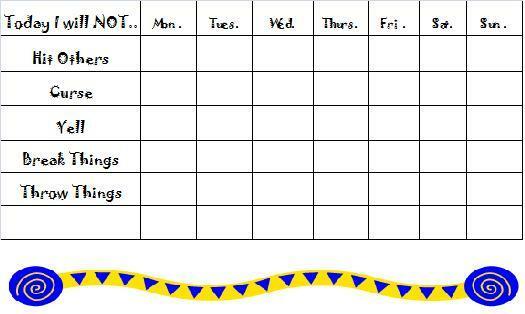 Free behavior charts for kids to download and help with aggressive behavior in children, child tantrums, or chores. The ones that are provided on this page are intended for older children to decrease behavioral problems, such as yelling and hitting. If you are looking for something different, you are sure to find another reward chart that is suitable for your needs on a different page. These work well along with other ADHD treatments for children if used correctly. I say this because they are not meant to be used as a punishment when a child doesn't earn a sticker, but merely positive reinforcement when he/she has a great day and does earn one. If you're not sure how to use them, check out my page with information on how to use printable reward charts. There are also additional printable certificates that are all free to choose from that can be used for a variety of needs, such as rewarding for a clean room or helping others. 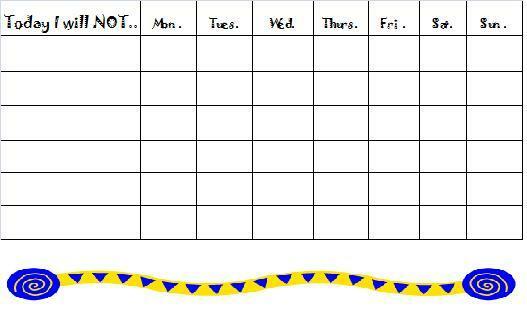 Examples for certain behaviors to monitor are given for you to review as well as a free blank chart. Just be sure not to use the system as a punishment when your child does not earn a sticker or reward. This can cause a negative association with the chart and result in it being ripped apart or thrown away or cause temper tantrums. You will need to turn off any pop up blockers and have adobe reader to download the free behavior charts. A link to download this is below. In addition to the use of behavior charts, I have some great ideas for ways to deal with aggressive children, helping your child with potty training, and learning how to avoid temper tantrums and meltdowns, or attention seeking behavior. So, be sure to check out those pages as well! You will need Adobe Reader (the latest version is recommended) installed on your computer in order to open and print a chart. You can get Adobe Reader here (a new window will open so you can download it without leaving this page, but you will need to temporarily disable any pop up blockers to open the new window and the charts).